Cthulhu comes to battle in New York and Tokyo in this first issue of the series. The return of the Great Old promises to sow chaos on Tokyo and New York where scenes of madness multiply. Even the other monsters on the scene could sink into madness ... And you, will you be crazy enough to answer his Call? Be careful this game is an extension of King of Tokyo ... + 1 more+ 1 more and cannot be played alone. 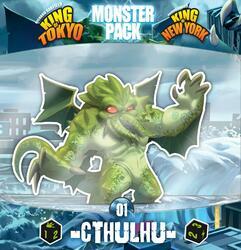 To be able to play it you must have a copy of the game King of Tokyo ... + 1 more+ 1 more.